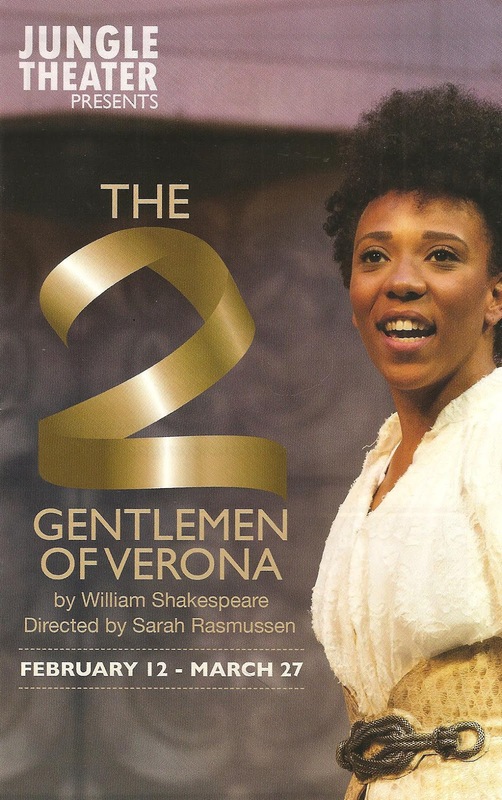 For those of you who get your Shakespeare comedies mixed up, like I do, Two Gentlemen of Verona is the one where a misunderstanding comes between young lovers, the clownish servants get the smartest and best lines, someone is banished, and a woman puts on pants and a hat and is instantly unrecognizable. Sorry, that's not very helpful, let me be more specific. Two Gents is the one about two buddies who go off to the big city of Milan, one finding love, one forgetting the love he left behind. Valentine falls in love with Sylvia, as does his friend Proteus, despite the fact that in the last scene he was in love with Julia. Proteus sabotages his friend, Valentine is banished and falls in with a band of outlaws in the forest, Sylvia goes looking for him, Proteus follows after her, and... all's well that ends well! Oh wait that's a different play, but you get the picture. It's a typically silly Shakespearean plot, but the joy of the play is in the clever and beautiful lines, and the way this strong cast of some of the Twin Cities best female actors brings the story to life. As everyone knows, in Shakespeare's time women were not allowed to be actors, so all roles were played by men. This production (like Ten Thousand Things' Henry IV Part I last fall) turns that tradition on its head, with all roles played by women (and girls, with a few youngsters adding some youthful energy and charm). This allows these fantastically talented female actors to dig into roles they would typically not play, puts a twist on the relationships, and makes one think about gender roles and stereotypes, but it never gets in the way of the storytelling. You still believe in the bromance (why isn't there a female version of that word?) between Valentine and Proteus, and the romantic love between Valentine and Sylvia, and Proteus and Julia (or Sylvia, depending on the day). These 14 women (with an age range of 65 years), plus one dog, are all wonderful storytellers who work and play well together under Sarah's direction. Highlights include Christiana Clark's athletic (she climbs a tree, twice) performance as Proteus, Mo Perry's lovestruck Valentine, Shá Cage's silly suitor, Lenne Klingaman's lovely Sylvia, stage veterans Barbara Kingsley and Wendy Lehr (gifted and agile physical comedian), a very funny George Keller with her dog Bear (who's completely nonplussed by the whole affair), Maggie Chestovich's down but not defeated Julia, Andrea San Miguel and Madelyn Pham with some charming musical performances, and Maia Hernandez and Lily Wangerin as two of the cutest outlaws you've ever seen. Moria Sine Clinton's costume design is sheer perfection! Not only is it all lovely to look at, but the colors and themes help to delineate place and character. The male characters wear leggings with ornate jackets or capes, the female characters floor-length gowns with abundant skirts. The two gents are dressed in neutral tones, Julia and her servant in soft pinks, the people of Milan in shades of pale green and teal, and Slyvia alone in stunning gowns of rich berry tones, including a pair of red boots I covet. 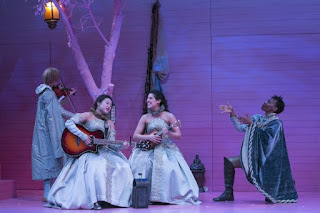 In fact the entire cast is shoed in such cute boots (short and tall alike) that one almost wishes winter would last forever! Andrew Boyce's set design is open, playful, and very pink, incorporating onstage seating on either side of a large open space. Two sturdy pink trees, a string of lights, and a second story make good use of the vertical space. Entrances and exits are frequently made through the audience (keep your feet to yourself if you're sitting in Row D! ), which brings the story right to the people, as Shakespeare intended. Two Gents is a light and fun romantic comedy, and the tone of this production is playful and fun and features excellent performances by some of our most talented female actors. 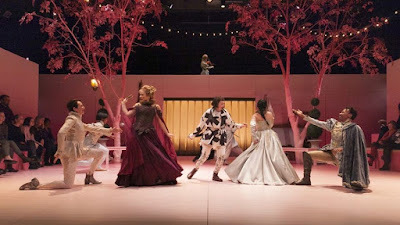 So head to Uptown, grab a bite to eat at one of the great area restaurants, and enjoy a fun and accessible night of Shakespeare with a twist (playing through March 27).